Ecological economics describes itself as a transdiscipline, or sometimes as a field of study, in order to avoid the usual academic term, "discipline". Although this theoretical immaturity limits the contributions the field can make to contractionary economics, there are three areas where it has impressive credentials and where its contributions are therefore likely. The first is the expertise that many ecological economists can claim in the areas of renewable and nonrenewable resources. Researchers like Cutler Cleveland, Robert Ayres, and Robert Costanza have studied such resources and their growing scarcities in detail, and could add scientific heft to ENL's treatment of these topics. Ecological economics could therefore help improve the environmental concepts and tools within the guiding framework of contractionary economics. Principles such as these are essential in the functional framework, which deals with the economy as it is currently structured, and is therefore responsible for policies that will achieve the objectives established by the guiding framework. Ecological economics has also done impressive work in a third area — the monetary valuation of ecosystem services. This permits the use of cost-benefit analysis to assess a project's social feasibility, and opens environmental protection up to various market mechanisms. In the absence of a guiding framework, such valuations can be disastrous because they expose nature to the ecocidal logic of capitalism. In the context of contractionary economics, with a guiding framework such as ENL firmly in place, such techniques and approaches could help us achieve desired ends. ENL contributes to the guiding framework alone. 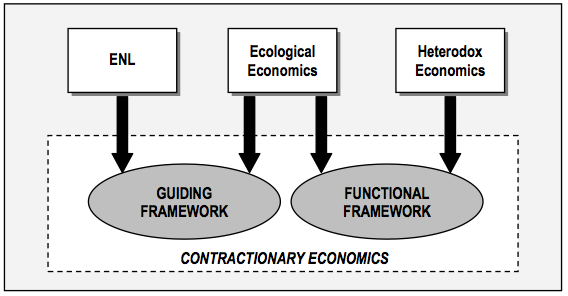 Ecological economics contributes to both the guiding and the functional frameworks, whereas heterodox economics contributes predominantly to the functional framework. It should be noted that this proposed structure bears some resemblance to that of standard economics. Standard thought has numerous branches, but its main division is between macroeconomics and microeconomics. Macroeconomics deals with the overall functioning of a capitalist economy: income levels, the unemployment level, interest rates, etc. Microeconomics deals with the behavior of individuals and firms, in particular how they react to incentives and budget constraints. The guiding framework is analogous to macroeconomics in that it addresses aggregates and objectives, while the functional framework is analogous to microeconomics in that it addresses operational specifics. This structural split in contractionary economics will likely be reflected by the division of the economics profession into guiding economists and functional economists. The background and skills required by the two areas are quite distinct, and it is doubtful that the same thinkers can successfully handle both sets of tasks. The discussion thus far has assumed a progressive stance, which permits ENL and the state to play major roles in the economy. Although the details must be left to conservative thinkers, the major change possible in the conservative context is to decrease the role of ENL in the guiding framework and to correspondingly increase the role of ecological economics. This would create what I call constrained capitalist logic: the retention of capitalist logic for most purposes, with the major exception of environmental limits. Despite their aversion to state participation, conservative contractionists may want to selectively use ENL in the guiding framework, for two reasons. First, rapid contraction is faster with ENL than without it. This is because ENL considers both human and environmental limits to production, whereas constrained capitalist logic considers only environmental limits. Whenever the human limit is lower, an ENL-based economy will produce less and thus contribute more to overshoot reversal. Second, economic growth has to date softened the effects of economic inequity, but these will become brutally apparent during rapid contraction. A conservative society may well decide that it must adopt some ENL principles during this period for ethical reasons and to maintain social stability. 1. Herman E. Daly and Joshua Farley, Ecological Economics: Principles and Applications (Washington: Island Press, 2004), xvii. 2. Herman E. Daly and Joshua Farley, Ecological Economics: Principles and Applications (Washington: Island Press, 2004), p. 43. 3. Herman E. Daly and Joshua Farley, Ecological Economics: Principles and Applications (Washington: Island Press, 2004), 360ff. The authors in fact provide six design principles, but the four listed here are the most important.